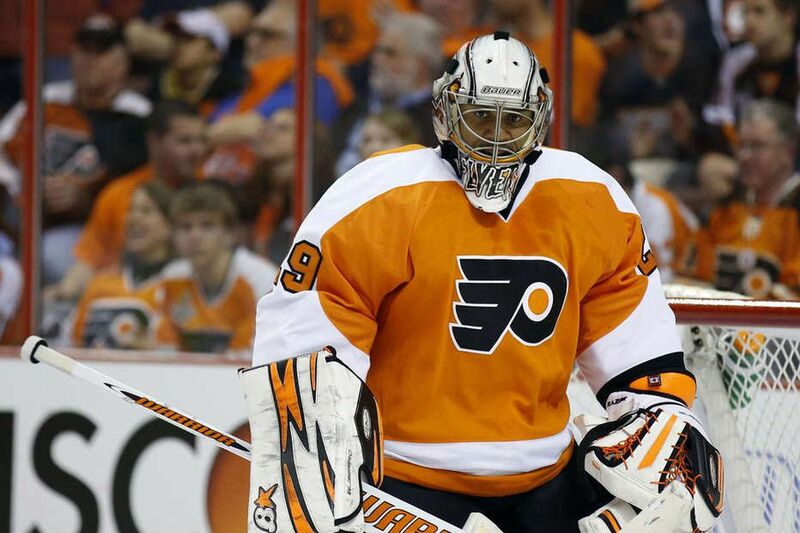 Ray Emery had two stints with the Flyers, the first in the 2009-10 season and the second in 2013. Former Flyers goalie Ray Emery died at age 35 while swimming in Ontario on Sunday morning. His death was confirmed by police in Hamilton, Ontario. Emery's body was recovered just before 3 p.m. Sunday. Hamilton police said a cause of death would be confirmed after an autopsy. "Ray was a great teammate and an even better friend," Flyers captain Claude Giroux wrote on Twitter. "Rest in peace Razor. I'll miss you man." Dan Carcillo, a teammate of Emery's with the Flyers and Blackhawks, wrote on Twitter that he was devastated. "You will be missed deeply Ray. I love you man." "I'm really, really saddened by this stunning news," said Paul Holmgren, the Flyers club president, in a phone interview. Holmgren was the Flyers' general manager when they signed Emery in 2009. Emery drowned after reportedly visiting a friend's boat at the Royal Hamilton Yacht Club. Emery and his friends went swimming in Hamilton Harbor, off Lake Ontario, at around 6 a.m. Sunday. Police said Monday that the drowning does not appear suspicious, according to the Associated Press. Police Inspector Marty Schulenberg called it a "case of misadventure." "They went out for a swim and unfortunately he did not emerge after diving in," Schulenberg told the Hamilton Spectator on Sunday. "We responded along with Hamilton Fire and EMS. Unfortunately, our efforts on the water and in the area just around the piers were met with negative results." Emery had two stints with the Flyers and also played for Ottawa, Anaheim and Chicago, compiling a 145-86-28 record, a 2.70 goals-against average, and a .906 save percentage in an NHL career that spanned parts of 11 seasons. He excelled in 21 games during the 2012-13 regular season with Chicago before it won the Stanley Cup. Emery did not appear in any playoff games that season. "In Ray's time with the Flyers, he was terrific," Holmgren said. "He was a competitive, combative, hardworking player who was loved by his teammates, and he loved his teammates. He just wanted to be around his guys, and his guys wanted to be around him. Ray was a great, great teammate." The Hamilton, Ontario, native's first stint with the Flyers was in 2009-10, when the team advanced to the Stanley Cup Finals. Emery had a 16-11-1 record with a 2.64 goals-against average and .905 save percentage that season. He had late-season hip surgery and did not play in the playoffs. Holmgren took a chance when he signed Emery to a one-year, $1.5 million deal in 2009. Emery had a long list of off-ice problems, including an altercation with a Russian trainer in late January 2009. There were also fights with Ottawa teammates, missed practices, suspensions and numerous driving violations. "Obviously, when we brought Ray to the Flyers, there were some red flags there. He had some issues in Ottawa and little bit in Russia when he played over there," Holmgren said Sunday. "I think we did our due diligence and our homework on him. We all talked to him, we all spent time with him, and we thought there was very little risk for a chance at maybe really having some success with a guy who, at the time, was considered one of the good young goalies in the game. I think it was a good move on our part." Emery's heavy partying became a part of his identity in Ottawa, and he vowed to improve his off-ice conduct when he was introduced at a news conference after joining the Flyers in 2009. He said he would continue to be a fiery player on the ice. "I know I have the opportunity and I'm not going to jeopardize that or make people who are giving me this opportunity look bad," he said at the time. Emery returned to the Flyers in 2013, a few years after undergoing Bo Jackson-like hip surgery and making a remarkable recovery. He had a brilliant season with Chicago the previous year, going 17-1 with a 1.91 goals-against average and .922 save percentage. "I think back to the last game Ray played. He shut out Calgary, 3-0, and the wheels kind of came off with the hip issues he had," Holmgren said. "…But he was able to come back after what we thought at the time was a career-ending injury, so that's another credit to his character and his determination. I have high praise for Ray Emery." Ray Emery became a mentor to Kaseir Archie (left) of Kensington. Holmgren said the first time he talked to Emery about possibly joining the Flyers "he was quite open and quite frank about some of the things he went through. He thought he was worth a second chance and we thought he was, too." Emery did lots of work with young players involved in the Ed Snider Youth Hockey Foundation, said its president, Scott Tharp. One of the first things he did when he became a Flyer was to work a street-hockey clinic on Emery Street. "He became a mentor to Kaseir Archie of Kensington," Tharp said. "Kaseir just completed his junior year at Drexel" – he is an international business major – "and Ray had him as his guest to several games and hosted him for postgame meals in the locker room. He never turned down a request to appear at our events." Emery conducted several goaltender clinics, which led him to become an inspiration and mentor to Thomas Brown, a West Philadelphia resident who went on to become a goalie at Penn State Berks and is now one of the Snider Foundation coaches, Tharp said. Emery was drafted in the fourth round (99th overall) by Ottawa in in 2001 and he led the Senators to the Stanley Cup Finals in 2007. His last NHL game was with the Flyers in the 2014-15 season, and he then played in Germany before retiring in 2016. Holmgren lauded him for his athleticism and said he was a "big part of the team's success in making the playoffs" in 2010. During his NHL career, Emery was one of the league's most combative goalies and was involved in numerous fights. "It's my favorite part of the game," he once told the Ottawa Citizen. In 2017, TMZ reported that Emery was arrested for allegedly assaulting his ex-fiance, Keshia Chante, an R&B artist.